This popular style of bollard is made from Galvanised steel to provide a cost effective strong security & pedestrian control. 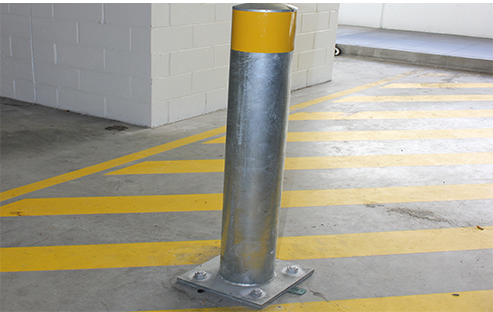 This popular style of bollard is made from galvanised steel to provide a cost effective strong security control product to suit general security and pedestrian control requirements. This product has been widely used in shopping centres, hospitals, banks, places of business and other public areas. With an easy to install base plated fixture, these heavy duty bollards are also available to core fix and in powder coated finishes. They are also available in a variety of sizes to suit your specific needs. Please visit our bollard builder to obtain pricing and design availability. The safety yellow top adds extra visibility particularly in the carpark environment. The cost of the plate is included in the listed price. Visit our bollard builder to obtain pricing and design availability. The safety yellow top adds extra visibility particularly in the carpark environment. The cost of the plate is included in the listed price.